Occupy the SEC is pleased to see that the CFTC has acted upon Barclays’ extensive and long-term practice of fraudulent pricing of LIBOR and EURIBOR. The CFTC’s $200 million dollar settlement with Barclays, the Department of Justice’s penalty of $160 million and the United Kingdom’s FSA settlement of £59.5 million are significant enforcement achievements. Barclays’ mispricing of reference rates has affected entire economies throughout the globe, given that businesses of all sizes routinely borrow on reference rates tied to LIBOR and Euribor. This arbitrary and self-serving rate settings affected corporate customers, floating rate lenders, derivative counterparties and ultimately any entity or person doing business with companies borrowing at LIBOR. There is a strong argument to be made that while $452 million of total settlements that Barclays agreed to is not an insignificant amount, it pales in comparison to the damages caused by incorrect pricing on HUNDREDS of TRILLIONS of dollars of financial contracts. More recent developments have made clear that criminal manipulation of LIBOR has extended well beyond just Barclays. Many of the banks involved in LIBOR and Euribor pricing were borrowing at prices typically significantly higher than their LIBOR and Euribor quotes during the period in question, and we have strong reason to believe that mispricing of these reference rates was rampant throughout the industry. Accordingly, we hope the CFTC and other bank regulators do not limit their investigations to Barclays, and instead scrutinize the activities of all of the banks that participated in the setting of these reference rates. Further, Occupy the SEC expects the regulators to pursue criminal prosecution of the individuals that participated in this fraud. The CFTC’s press release makes clear that it knows the exact identifies of the principal actors behind this criminal activity. 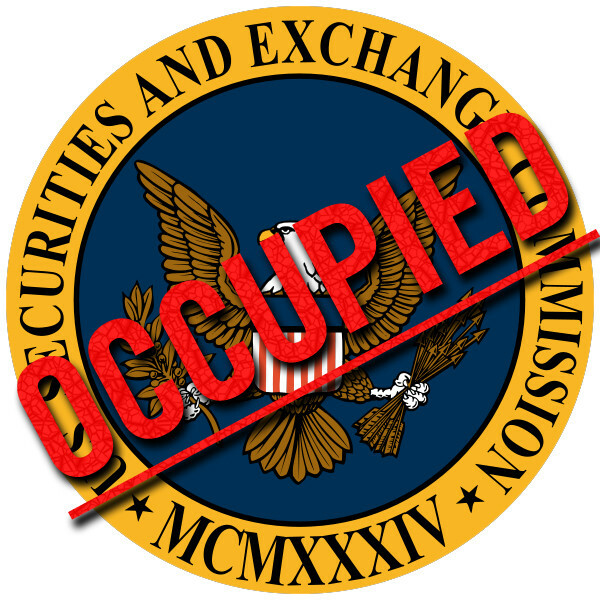 Occupy the SEC believes theU.S. has historically had been viewed as the strongest, fairest and most transparent financial market in the world. The entire U.S. economy benefits from this leading position. Yet if our regulators do not prosecute perpetrators, financial institutions will continue to act fraudulently. Regulatory fines will be disregarded as the mere cost of doing business, and will lose their deterrent value. When regulators fail to prosecute, individual perpetrators often walk away scot-free, free to collect their bonuses and continue engaging in similar activities at the same or another institution. We encourage the regulators, particularly the SEC, to continue to use all the investigative and prosecutorial powers at their disposal to pursue the various securities law violations that have become apparent on an unprecedented scale during the current financial crisis. We are particularly distressed that the SEC has not taken action to prosecute any major CFOs or CEOs for Sarbanes-Oxley violations, and look forward to the day that the SEC takes an active role in enforcing that critical piece of investor protection legislation. Strengthen the laws that conservatives crafted to protect individual 1% execs. And still no perp walk/jail time. Naturally they are goin after decent hard working public union families money. Pressure the FED, all Pols to prosecute the criminal banksters!! Banks still strutting free, as if they didn't create the worst economic crash in 70 years. More slaps on the wrist. Yes, we need to see big fish locked up and all their wealth forfeited. Question: why do we have regulations, rules, laws? For 15 years i worked in a prison as a "Facilitator of Cognitative Programs" ( a five and dime title only a bureaucrat could dream up). i asked the above question in every class, (it was not a requirement, i was curious). it is a simple fundamental question, and as such revealatory. Republican democrat liberal conservative, "Independent", Anarchist': where did you ever get the idea ambivalence was an answer? Where do I sign in blood? Replace Holder with Nader and watch the games begin!!! Believe it or not, the government is finally cracking down on offshore tax dodgers. Nearly 80,000 foreign banks and financial firms will begin sharing information on Americans who stash billions overseas to avoid the IRS. Thanks to the Foreign Account Tax Compliance Act, any overseas bank that doesn't comply will face hefty fees on all of their American business. Last week, the Treasury Department released the first list of banks who have chosen to comply with the 2010 law, and more banks are may soon decide to cooperate. Soon, banks in 70 countries will start providing the IRS with the information they need to identify tax cheats. Even countries like Switzerland and the Cayman Islands, both notorious for being tax havens, will participate with US officials under the FATCA. For too long, the billionaires have avoided paying their fair share in our nation. They've profited off of the use of our commons, and our economy, and then hoarded away their cash in overseas accounts. These tax cheats cost our nation billions every year, and it's about time that they be forced to pay up. The best part of the SEC is their Senate Banking Commitee, comprised of 3 Dems and 3 Reps, all of whom took massive donations from JP MOrgan. Laughable, update on criminal banksters. What is more Important to me is the rampant speculation by Wall St speculators in oil. It affects the price I pay at the pump every day. We are paying 75 to 80 Cents on the Gallon to these speculators at Goldman Sachs and JP Morgan every day and they just laugh all the way to the bank at us . Obama and Holder do nothing about it because Wall St owns them I'm sick of being lied to by my government. Go to stopoilspeculation.org to learn how badly we are being screwed. Let me speculate and believe me it shall prove to be very true.My speculation is that everything shall become extremely Dare therefore valueless because USA together with Israel,and India are going to start the Third World War.So be happy. Capitalism and the contemporary monetary system has got no logical and moral rationale is therefore going to collapse sooner or latter which shall make strong capitalist countries like USA and India to take refuge in warfare thus shall wage wars on the weaker nations and weak capitalist or feudalistic countries which shall eventually take the shape of the world war.